The photo here is nothing more than a nod to Reformation Sunday. 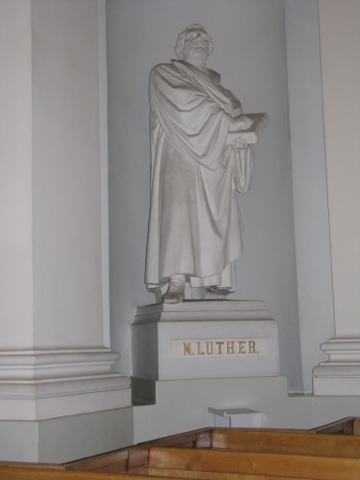 This is a photo of a statue of Luther in the largest cathedral in Helsinki. Luther stood up to the religious hierarchy in the late Middle Ages. Yesterday both of the worship services at my church ran over the time that we allotted for them. The reason for the overrun was two-fold: First, we received 12 new members into our church at both of our services, and second, we had a member give a personal testimony of how God was transforming her life and making her more content with less. Both of these events during worship took extra time. They were also both awesome. Our congregation needed to experience God "adding to our number" and to see the joy of the new members as they solidified their commitment to our family of faith. We also needed to hear the story of transformation that the testifying member shared. I always get comments after our worship services run "late." Most of the time the comments are directed at the sermon---jokes about my being long-winded, mostly. Sometimes the jokes don't feel like jokes. The ironic thing is that yesterday my sermon was EXACTLY 20 minutes in length at our Traditional service, which is a good eight minutes shorter than usual. Once I was told by a regular attendee that one of the reasons why she and her husband did not join our church (although they continued to attend) was because my sermons were too long. Since when is 25-28 minutes a long sermon? When I was growing up, a sermon wasn't really a sermon if it wasn't in the forty minute range: including the invitation. We did a time study during one of our staff meetings to address the curmudgeons who always seemed to have something sarcastic to say about my preaching and sermon length. We discovered that everything we do in the worship service is something that blessed a number people and to cut these moments might do more harm than good. In the end, we made a decision that we would trim what we could, and put up with the rest. Honestly getting out of church 15-20 minutes later than you expected shouldn't be a problem, right? Because maybe over time they will get the picture that church is just going to be an hour and 15 minutes in length. Yesterday at a stewardship meeting the comment was made "if we can cut your sermon time in half, can we reduce your salary?" It was said in jest, supposedly. But again the focus was on my sermon for that day, when the sermon was actually shorter than it has been in years. My response was to smile sweetly and say, "well I know one way to save you my entire salary, and I'd be happy to talk to you about it." Nothing more was said at that point, in Fact a couple of elders approached me to ensure I didn't think he spoke for them. It's all good. So here's the thing: I'm not shortening my sermons. They aren't terribly long and they aren't too short that you leave wishing there'd been more. They average in length fro 24-28 minutes. They might be long by tired old mainline Presbyterian standards--- which dictate a preacher should preach no longer than 15-20 minutes whether the congregation needs it or not. And when they do bust out with their pithy little homily, they read it word for word from their notes. I'm not preaching for 45 minutes like Rob Bell does, I'm also a believer that you should be able to say what you need to say in 30 minutes or less. If you haven't gotten it all out at that point, then you might want to refine your thoughts a bit. And you need to say what needs to be said without reading it off some script. Reading your sermon isn't preaching. It's reading. Preaching is an event where people feel the transformative power of Christ from an authentic delivery of a relative, engaging, Bible-based sermon. So why are we so hung up getting out of church "on time?" I need to go back to my age old argument: people will choose to watch movies like Avatar or Titantic which are both over three hours long without battling an eyelash. And when it comes to concerts including Christmas Eve, they don't have a problem with it. At our upcoming Christmas concert the doors open at like 5:30 and there's 30 minutes of instrumentalists before the service starts. Yet some of the same parishioners who give me a hard time about being long winded will sit there for two hours just to have the seat they want. And yet Every year someone walks up to me prior to the Christmas Eve service and they say "you're not preaching very long tonight are you?" It's always the sermon that gets hammered, isn't it? Not singing every single stanza of ever hymn... Not the announcements (at least not the ones that are funny) Not the children's sermon (although some "get off my lawn folks" have expressed their desire for it go away...) Not hours of bells, orchestra, carols and candlelight. It's always the sermon that takes the hit. 60% of my time is spent focused on worship at both services and more specifically on the sermon. I begin thinking and praying about the scripture passage at the beginning of the week. On Tuesday I begin working on the notes for the sermon, but reading commentaries, doing word searches and dreaming. On Wednesday I finish the sermon notes, and I work on my power point and on possible videos to run. By Thursday I'm just reading over notes, finishing power point and then preparing the schedule for the Crossing. On Friday I may take some to practice through the sermon tentatively. I also try yo put the finishing touches on my blog, where i basically write out what will be saying, On Saturday I will finalize worship stuff, and do a few practice runs of the sermon. On Sunday, I get here at 7:00 AM and get one more practice done before time to go! And one of my main concerns through all this is that it not go too long. But in the end, I will say what has been given me to say and do it to the utmost of my ability. Even if it adds (horrors!) a few minutes to the worship service. Those who feel they can't get out on time at our later services should attend our early morning service First Light which will be a traditional service with a twist and will only last 45 minutes.